Put a ReadyLift 44-2575-K 7" Lift Kit With SST3000 Rear Shocks on your 2015-2019 Ford F-150 4WD Pickup. The ReadyLIFT 3.5" SST Lift Kit is developed to give F-150 owners a packaged front/rear lift option that lifts the front of the vehicle 3.5" with 2" in the rear. Lift the front of your 2015-2019 Ford F-150 with the ReadyLift 66-2215 2.25" Leveling Kit. ReadyLift Leveling Spacers are manufactured from CNC-machined billet aluminum for a lifetime of performance. These leveling spacers provide 2.25" of front lift via strut extension Smart Suspension Technology. 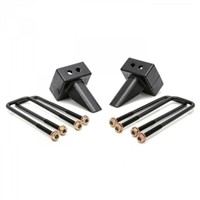 Adjust the rear height in your 2004-2019 Ford F-150 with the ReadyLift 26-2105 5" Rear Block Kit. ReadyLift Block Kits are manufactured from heavy duty cast iron and are based on the OEM design. This gives you a heavy-duty construction, just like the factory blocks. 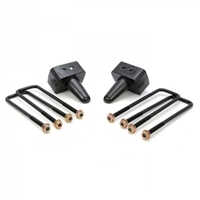 Create more rake with the addition of the 5" tall rear block kit making it ideal for lifted trucks that tow or haul. 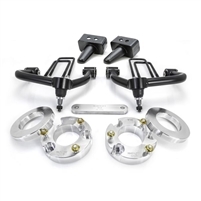 The ReadyLift 26-2104 4" Rear Block Kit lets you adjust the rear height in your 2004-2019 Ford F-150. Fine-tune the rear height in your 2004-2019 Ford F-150 with the ReadyLift 66-2053 3" Rear Block Kit. This 3" Rear Block Kit features an OE style cast-iron construction for maximum durability, just like your factory blocks. Each kit includes u-bolts, blocks, and is ready for installation.